What a plonker. What an absolute gimp. Graham Taylor, we salute you. Even Jeremy Beadle has more friends than you. People point at you in the street. Dogs gravitate to your garden to do their business. Have you ever offended a witch doctor? Because Graham, matey boy, you are cursed. Everywhere you go, death, famine and plague follow. Kindly leave the solar system before you do some real damage, you sad, sad lonely man. Well, that was a bit spiteful, wasn't it? Just because he managed to drop England out of the European Cup without winning a single match. It could happen to anybody. But it didn't. It happened to Sadman Taylor. Ha ha ha ha ha ha. The man looks like a deputy headmaster. I don't even like football and I think he's a plonker. And now poor old Krisalis have got to try and convince you to buy a soccer management game endorsed by ol' Jonah himself. Luckily, you shouldn't take much persuading 'cos it's a pretty damn good game. Bear in mind that I'm not the world's biggest football fan, and that's praise indeed. I almost found myself buying a sheepskinlined footy manager's coat. Well, almost. Y'see, the biggest advantage of this game is that it actually makes you feel like a manager. Other footy games let you pick your fave Division 1 team, and then dump you and them at the bottom of Division 4. Not very realistic, eh? So, with this little chestnut, you begin by choosing one of a few rather crap Division 3 teams. The chances of you getting Grimsby Utd into the big time are rather slim, but by proving yourself on the lower teams you can move to other, better teams, and thus work your way up to manage your fave Division 1 team. And if you're really rubbish and lose all your matches then you become England manager and lose the European Cup. Sorry. But you can become England manager, and of the two disks, the second is devoted entirely to that challenge. It's a lot more detailed than other management games. Every single player from every single team is featured in a little file all of their own, including all their genuine stats. And as the game goes on, players you know and love will get older and retire and fresh new players will move up from your junior squad. Like I said, it really gives you the impression of being part of a real sport. Brilliant. OK, the actual game. As with most of these games, it's controlled from icons and a little filofax diary thing. You can set scouts to spy on other teams or to give you a report on another player to see if he's worth poaching. You can, of course, transfer players and even borrow them from other lower league clubs. You can train your whole team, or give each individual player more specific training. You can basically do everything except smack Jimmy Hill on his aggravating chin. The graphics are nice and clear for the icons and so on, and in the matches it's a viewed from the top run-around like Kick Off, but with bigger graphics. You don't get to control the action, but you make substitutions whenever you want and after it's all over you can comment on your team's performance and make them feel really insecure. Another nice feature is the ability to watch any match from any division. So if you really can't be bothered to see how your boys do against Scunthorpe, you can go and watch the Liverpool and Man Utd match instead. Not exactly very good management, but it lets you keep track of your fave clubs while you sink without trace. And that's another good point (by Jingo there's a lot of 'em). If your team starts to drop like a stone, you can abandon ship and move to another team. And then trash your old team into the ground. Ho ho ho. It's a good game basically. If it could get a response from such a sportophobic like me, then it's got to be good. Maybe people who know football inside out will find some inconsistencies, but I doubt it. I enjoyed it immensely, and I reckon you will too. Yes, you. Well worth a gander. Intuitive icons, and the matches look great. Atmospheric match FX but not much room for anything else. Highly enjoyable, with a real sense of participation. Starting at the bottom really gives you something to play for. 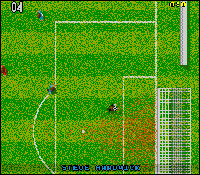 Big sporting events are quite often responsible for the release of quite a few computer sports games. This year sees a number of athletic-style games to coincide with the Olympics and the European Soccer Championships have prompted the appearance of a number of soccer games. Krisalis haven't missed the bandwagon either, with their Graham Taylor-licensed management game. As England fans will have noticed, Graham Taylor's boys didn't manage to do the business in the European Championships, being knocked out of the first round! However, if you think you can do it better and urge your team through a victorious season, you now have the chance to try. You are placed in the driving seat of a hopeful third-division side trying to break through to the higher divisions (and win one or two cup matches to boot). As well as the usual picking of team member and organising of training, you also have to do some nifty dealing to keep your side together. Teams of scouts can give you reports on other teams and players, allowing you to keep tabs on the players worth investing in in the transfer market. For some extra talent, there is also a squad of trainees, who must be watched and contracted into the side if they are up to it. Graham Taylor's Soccer Challenge is a very slickly produced footy manager game, with more options and features than your usual management sim. Even though there is a lot of game content, the game still manages to offer a lot of smooth presentation to keep you interested. The match-day sections are well done, replacing the usual tiny, badly-animated sprites with some very nice-looking football. There is even a match report at the end of the game in authentic reproductions of the sports page in local papers. Although the game is not exactly Player Manager, it is still a worthy attempt. If you're a budding Graham Taylor, then this could have you plugging at the league for some time. Just remember to put three men up front when you are playing Sweden! An involved and in-depth example of the good old footy management simulator. Some really nice presentation, graphics and intermission screens makes the game look very slick indeed. A few confusing factors may baffle the novice, but hardened players will find it fun. A sterling attempt to add new depth to the football simulation genre. There's more to being a manager than making sure your team eat Shredded Wheat. Now to be really true to the licence, this game would have to be very dull, almost impossible to comprehend, and fairly crap. It would begin with a team selection feature where you had to pick out the most uninspiring dullards you could find. Then there would be a graphic interlude, where you could watch your players run aimlessly up and down the pitch whilst the opposition rattle in a few goals. Finally there would be a press conference, where only an air of inscrutability - and the correct choice of excuses - would see you live to fight another day. But no. In actual fact GTSC is a very enjoyable game, with extensive features, excellent looks and a great degree of tactical involvement. So it's probably safe to say that it has nothing to do with Graham Taylor at all then, apart from those two - easily ignored - words on the box. Mind you, Krisalis do maintain (somewhat inadvisedly, really) that Graham was actually involved in the development of the game. Hmm, so that's what he was doing when he should have been preparing for Sweden. Opening with one of those icon-based menu screens that we're all getting mighty sick of (thanks a lot, Footballer of the Year - grrr), the path is clear to a veritable feast of options and info. Apart from a few transfer market sorties to the numeric keys, everything is controlled with the mouse. Although this makes the selection procedure very user-friendly, the large number of sub-sub-sub-menus often calls for some major volleys of button clicking. This gets a tad annoying, but what do you want, a servant to take care of the controls for you? Yeah, me too. While it's the abundance of menus that houses all the tactical and statistical features that make this game a winner, the best feature of all is the (largely irrelevant) animated match sequences. These don't serve any practical purpose, unless you're into the idea of watching out for weaknesses in individual sprites so you can put that player - once you've worked out who it is - in for extra training. Yeah, right. What these action sequences do provide, though, is plenty of entertainment. If you're no friend of tension you can opt to not watch the game, or indeed watch a totally different game instead (Crystal Palace are always a laugh), ut you'd really be missing out. You can't help but become engrossed, shouting abuse and encouragement at the screen and wishing you could grab a joystick and take control (you can't, though you can make substitutions). The one real problem with GTSC involves the buying and selling of players. Wheeler-dealing on the transfer market has always been seen as the key to success in games of this type, yet there's no wheeling and precious little dealing going on here. The other clubs won't accept anything less than the listed value for their players, though they'll accept that figure without hesitation. The directors of your club won't allow you to offer any of your players for any less than the listed sum either. This is a problem, since players on the transfer market are likely to be dead sooner than bought. Selling a handful of crocks to buy a half decent player seems the only real way to build your squad, but it just ain't possible. The vast repertoire of other options (e.g. training) goes some way towards transcending this little problem. Strategy games are on the whole quite hard to quantify. The only way to test a strategy game's appeal is to see how long you can play it before getting bored, and here GTSC came up trumps. After a shaky start propping up the league with York City, I took control of Walsall and led them, over a great many hours, to promotion to Division 2 (that's Division 3 in old money) and the league cup quarter final. Yowsa! I would no doubt have gone on to win the treble, but the night watchman came round and threw me out. Oh well, as long as no-one remembers to ask for the disks back. Any niggling flaws are outweighted by a stockpile of features, and match sequences destined to have you on the edge of your seat. Just pretend it's named after a different Graham Taylor. With Graham Taylor cast as the new villain of English football, Tony Dillon joins him on the bench at the sidelines of Krisalis' new licence. There isn't a huge amount that can be said about football management games that hasn't been said already. Krisalis' second star licence in as many months claims to bring the genre bang up to date - but, then again, don't they all. I don't wish to sound too skeptical, but the genre has been flogged to death over the years and the number of management games in my software library far exceeds any other type of game bar the ubiquitous shoot 'em up. Each new game purports to bring the genre bang up to date with added depths and areas of realism, and more options to choose from than ever before. The strange thing is, Krisalis look set to actually pull off such boastful claims and have really pulled out all the stops on this one. For the most part, management games involve juggling a whole wad of figures and statistics in an effort to produce the perfect team. The basic aim is to increase your team's overall rating as much as possible so that you can cream the opposition! Even when management games started substituting numbers behind a glossy veneer of terms and ratings it was still a question of numbers. There was never much in the way of personality to either the teams or your position. Games like Track Suit Manager and U.S. Gold's The Manager went some way to solving the problem, by adding more random touches such as substitutions and the like, but things still appeared quite impersonal. In Graham Taylor's Soccer Challenge you are treated as a real person and expected to treat your players as such, too. Once you've selected your squad, trained the hell out of them and transferred all your crap players, the game really begins to shine. For a start, you have a lot more personal contact with your team. At the end of a game, you can give a little speech, ranging from a few choice words to a pat on the back, and there's even the need to comment on games at hastily-convened press conferences. Players sustain real injuries, ranging from pulled muscles and broken legs, and not just a universal bruise which keeps them out of the game for 'X' number of weeks. The icon-driven options are all readily accessible and smartly designed, and enable quite complex actions to be carried out at the click of a mouse button. Players come with numerous statistics detailing their playing abilities, all of which can be changed by implementing the right sort of training for the right player. The transfer market is positively bulging with players waiting to be signed up and prolonged success means you start raking in the gate money to be able to afford these budding superstars. All the main options come as standard in these type of games, in much the same way that you would expect a MIDI sequencer to be able to quantise. So don't expect anything you haven't seen before, in that respect. The real clincher comes when matchday approaches as this is the one area where the player has little control and can only sit back and watch as his or her team either cream the opposition or have ten goals scored against them. And it's here that GTSC really excels. Rather than fill your head with numbers, or try to fool you with text. Teque London have tried to show a complete match being played. Anyone who remembers Football Manager 2 will cringe at this point, but believe me, it works quite well. 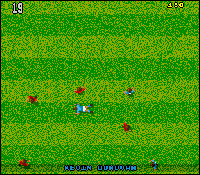 Looking like a cross between Kick Off and Microprose Soccer, the matches are viewed as any arcade football game, only you can't take part. This is the first time I've ever seen this approach work, and you find yourself inching closer to the screen shouting 'Come On' to your pixel players. Overall, GTSC is one of the best soccer management games I've played and certainly beats the likes of US Gold's The Manager and even Anco's Player Manager. Having said that, the game adds absolutely nothing new to the genre except for the full-match sequences. The national league seems at odds with Graham Taylor's international stature and it seems out of place for him to be tinkering away with the transfer market and domestic campaigns when he should be out their batting (kickin?) for England.